Articles by: "Erik Martin—Independent Journalist"
In a world where consumers are accustomed to getting many digital goods for free—from apps to podcasts to instant facts online—convincing them to fork over funds for content remains a tough sell. And hanging on to those hard won customers is a challenge unto itself. For proof, consider the subscriber churn rate among publishers, estimated at 30% last year. Yet many publishers today are tackling this problem with a variety of successful tactics designed to convert more freeloaders into subscribers. And recent data suggest that publishers are learning from past mistakes and become better attuned to what attracts and retains paying patrons. Per The Lenfest Institute for Journalism, fewer newspapers are giving away the store than they used to. They have found that 78% of American newspapers charge for digital access. Eighty percent of these use a metered model while 4% employ a hard paywall. The American Press Institute recently found that around 73% of news organizations polled provided free trial subscription offers for digital content, with less than one quarter of free trial readers converting to full-price subscriptions. Discounted trial subscription offers fared better, with nearly 72% of polled organizations reporting a greater than 76% conversion to full-price subscriptions via this method. A separate API study of 4,100 newspaper subscribers revealed that several factors motivate people to pay for content: access to local news (chosen by 30% of respondents); convenience of print/home delivery (15%); a discount or promotion/discount (12%); a topical focus (12%); and trust/quality (9%). Additionally, 45% eventually subscribed because of a free trial or promotion, and a paywall meter triggered around 50% of digital subscribers to subscribe. The metered model has been especially valuable because it allows publishers to monetize engagement, rather than page views. The most important metric for publishers that want to grow digital subscriptions is engagement Skibinski says. Data collected by the Lenfest Institute show that most successful metered publishers stop 5 to 10% of their digital audience with a payment gateway. “In order to get your readers to pay for your digital content, you have to actually ask them to pay. In the past, many publishers were too conservative with their meter rules, and as a result, they would only ever ‘stop’ a small percentage of readers with a subscription ask. We’re now seeing publishers become more confident in saying to readers, ‘we have content that is high quality, valuable, and worth paying for,’” says Skibinski. A metered paywall isn’t for everyone, of course. 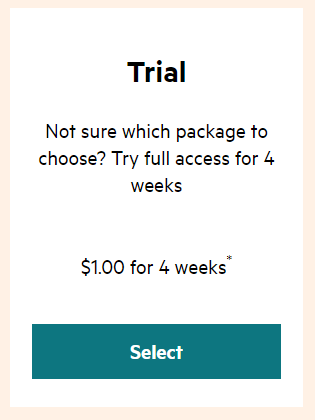 The Financial Times gravitated from the latter to a four-week trial for $1 model in recent years and hasn’t looked back (its annual premium content subscription is $559). Spooner’s motto? “If you want people to buy something from your shop, you have to welcome them in but not let them walk out with your merchandise without paying for it,” she says. One of the first brands to launch a subscription paywall—back in 1997—was Consumer Reports. It shifted from a subscriptions to a membership model earlier this year, offering four tiers: from free to all-access content (at $55 annually). Since then, the average order value is up 20%, the take rate for its all-access tier is twice what was anticipated, and new membership benefits and features have garnered half a million interactions. “Our research shows that consumers want relationships with brands they can trust. And people are more open to the idea of paying for convenience and unique value that extends to content that’s curated and personalized,” says Kim Stehle, vice president/CMO for Consumer Reports, headquartered in Yonkers, New York. A tiered membership model doesn’t necessarily have to focus on value or prestigious journalism as a main driver. Spirited Media, which manages Denverite in Denver, Billy Penn in Philadelphia, and Pittsburgh’s The Incline, asks its readers for monetary support at any level, although three higher levels of membership (starting with a “supporter” membership, at $35-99) are encouraged and come with extra perks. “We’re not forcing people to pay for content. We are asking people to pay because they love us. To succeed at membership, our readers have to believe, in their hearts, that we’re an essential part of their community. And to get there, to believe in our ‘essentialness,’ they must identify with our point of view, which is, ‘We love this city and the people who live here, so we want it to be better,’” says Brian Boyer, vice president of product and people at Great Falls, Virginia-based Spirited Media. If you want to improve your paid conversion rates, be prepared to do your homework and try a little tinkering. Your first task: Look closely at your data and segment it by user behavior. “Their behavioral data tells you how much value they’re getting out of your product. For instance, a user who views five articles per month is far more likely to become a subscriber than if they are reading only one a month. And that reader is up to 15 times more likely to pay for content if he or she is also subscribing to your e-newsletter,” says Skibinski. Next, make smart decisions based on that data you parse. 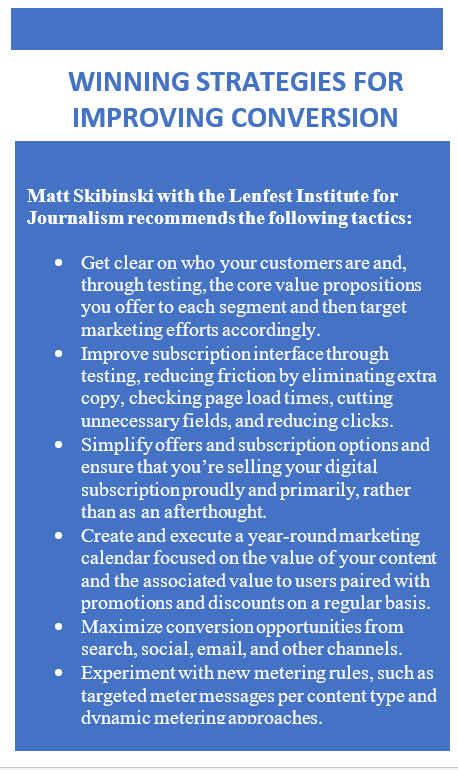 “When you’re sitting in a product meeting or talking to your staff about how to measure success with content, review how many engaged readers looked at a given article as opposed to total page views,” Skibinski notes. Experiment to create the optimum mix of free and paid content, too. “Don’t be afraid to change or tighten up the number of free articles you offer. Ask people to pay after you’ve made them aware of the value your brand offers,” says Skibinski. Consumer Reports’ Stehle recommends trying more personalized content. “We now offer a premium paid service called ‘Ask CR,’ where paying members can receive personalized buying advice from our specialists,” says Stehle. Using the right messaging language that moves users from free to fee is equally crucial. The secret to successful messaging is acknowledging the relationship you already have with the consumer and the moment they are in. “Even if their current relationship is ‘free,’ you can convey how much more they could be getting from your brand if they were willing to pay. We’ve found that using language around ‘upgrade’ or ‘gaining access’ works, because they intuitively connote additional value,” Stehle says. Erik J. Martin is a Chicago area-based freelance writer and public relations expert whose articles have been featured in AARP The Magazine, Reader’s Digest, The Costco Connection, EContent Magazine, The Chicago Tribune, and other publications. He often writes on topics related to digital media, technology, real estate, and business. Read his blog at martinspiration.blogspot.com.